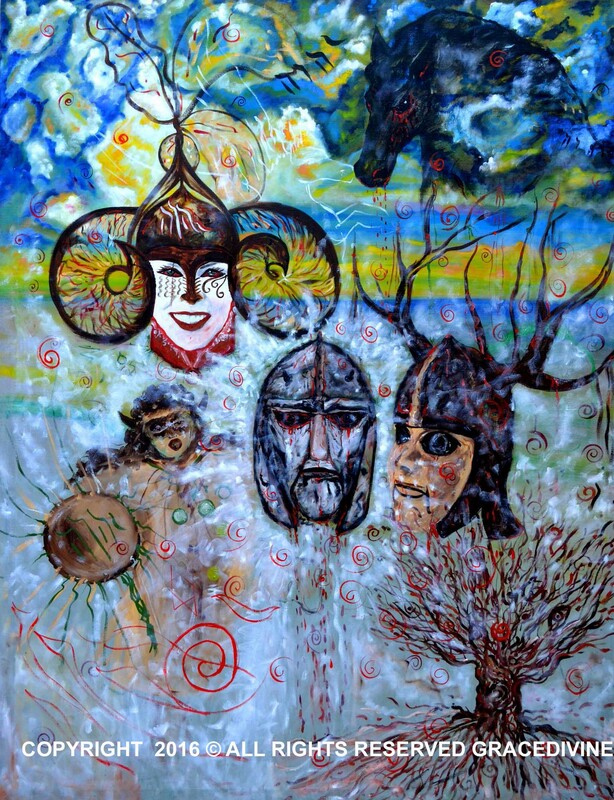 TITLE: "The Shaman, the Heart of the Dancing Drum and the Minotaur"
and become walls attached to television and computer screens? I say, lets start feeling again. Lets be human. Some people can't dare to be different. Please wake up... Being different means being unique. And that uniqueness is what makes us human. And we need you to be human. 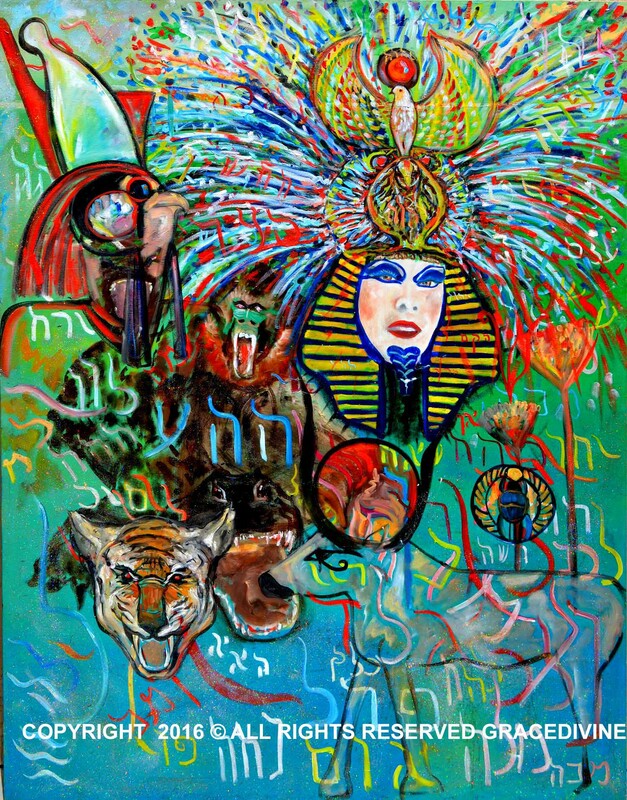 TITLE: "Quetzalcoatl Feathered Serpent Transformation"
you had an original thought? thoughts. And that's what makes you human. I perceive people as archetypes because that is what we are. And so, I free my feelings as I can compassionately love and hate at the same time. TITLE: "Moises was a Woman"
As children we were told fairy tales. 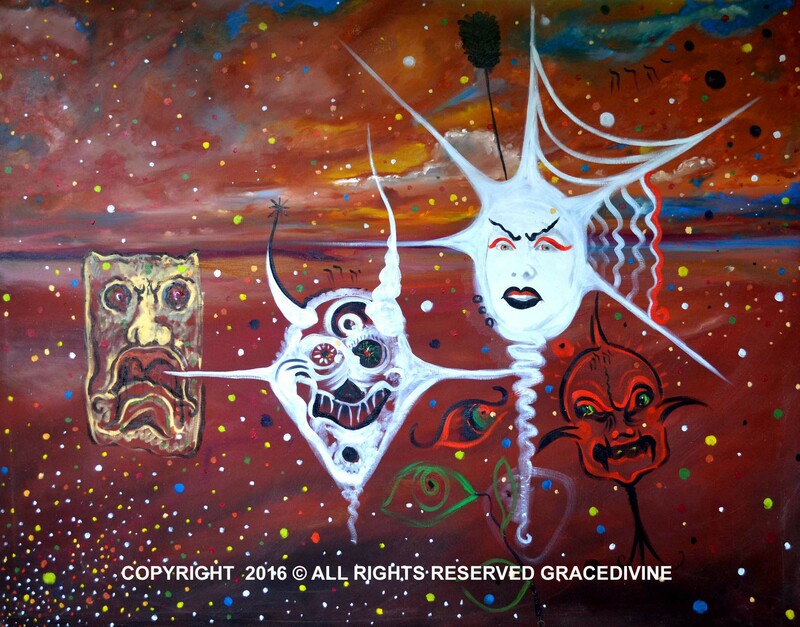 TITLE: "When War Comes Our Spirit is Ready. spirit of the spider time traveler." Today, as art galleries fill up with incomprehensible so called "objets d'art" like dead cows or boxes of detergents it begs the question, what is art? And if anyone defends the absurd as a reflection of humanity, the question then becomes, are we living in a TIME OF ABSURDITY? According to Google art is to be "appreciated primarily for [it's]... beauty...and... emotional power." I like this painting. I find it to be interesting. It is strangely pleasing to me, like an exotic meal. And I like that. I like something that feeds me even if it's different. I am not saying that you will find this to be "art." Instead, your definition of art may run the gamut anywhere and limited to from canvases of pretty flowers to empty shoe boxes. buck selling something they call art which has no deeply significant human value? something beyond their physical reality. So then, lets agree to disagree and lets find common ground. I too would like to have a box of detergent. But I will keep mine in the laundry room. And then, when the detergent runs out, I will throw the box out. universe, we will realize that we are not alone. is powerful, because your feelings are significant. 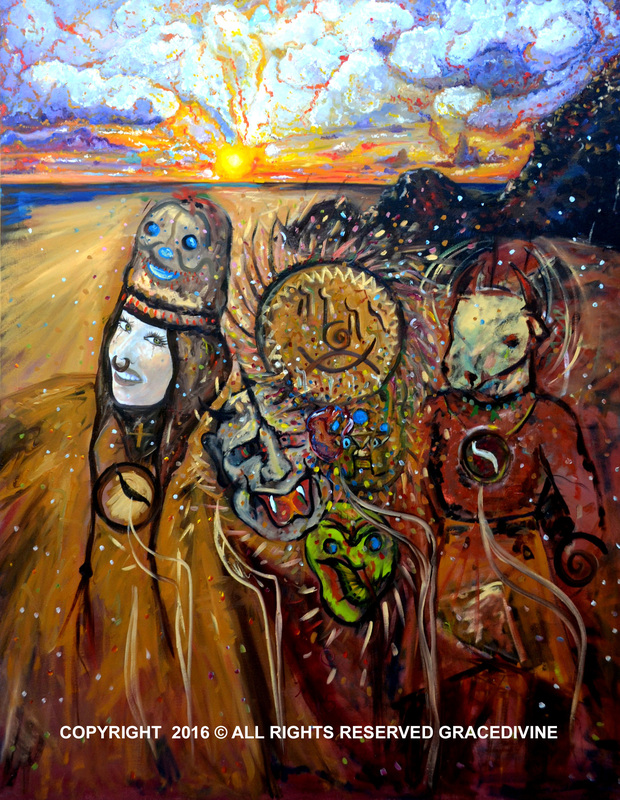 TITLE: "In the beginning the Heart of the Shaman was one with the Heart of the Earth." as the souls travel down to earth to be born." 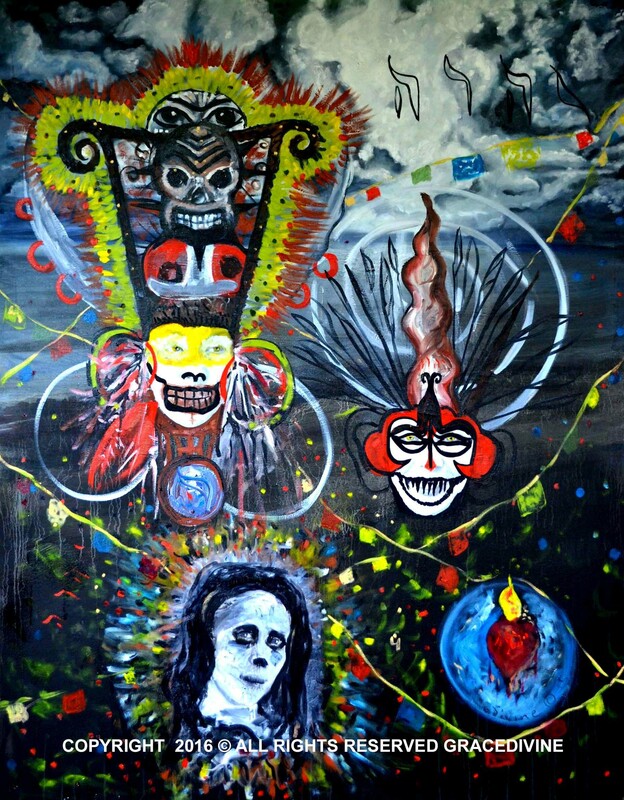 TITLE: "Latin American Lords and Powers. My life as a child in Mexico." 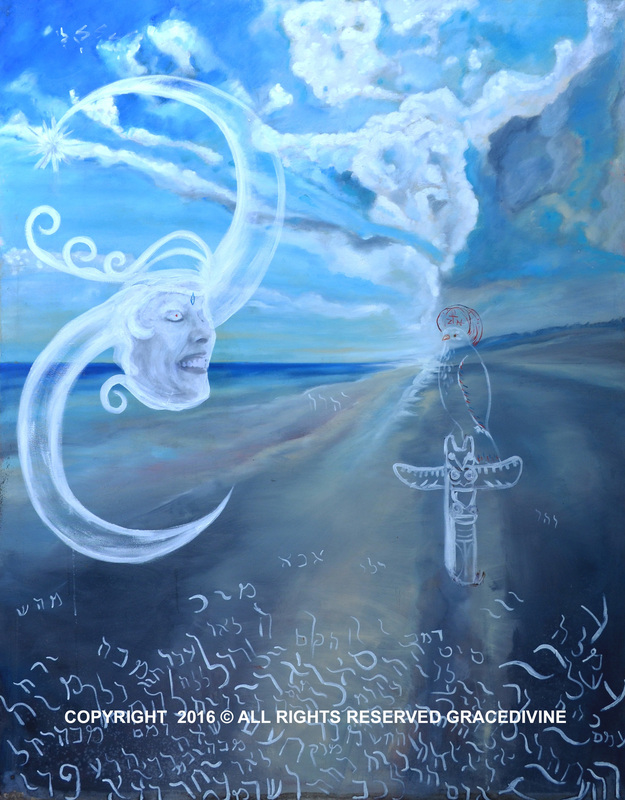 TITLE: "The Fallen Warrior and the tree of Yggdrasil"
The Earth, The Sky and the Words of God"
TITLE: "Overcoming Terror Escape from Egypt"
their feelings. Can you feel anything right now? Yes, we are receptacles filled with lots of things. And some of these things are completely unnecessary. 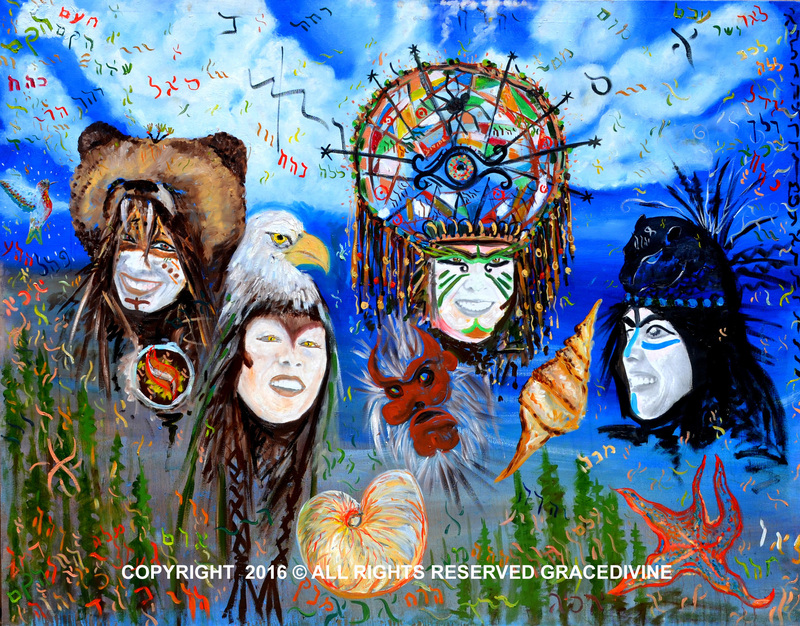 ART SERIES TITLE: "Healing the soul with the Shaman's Power!" Collect this beautiful work of art which measures approximately in size. This one in the world painting is made with quality acrylic paints on a sturdy wood support. 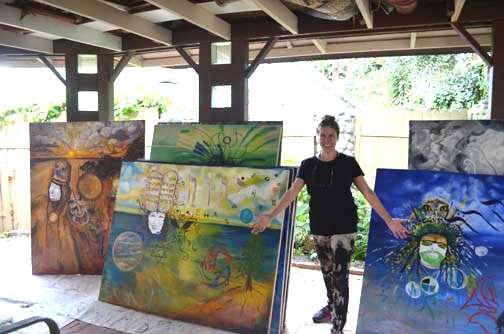 It also includes lightweight back stretchers which means that the art is READY TO HANG NOW! And if you want an even BETTER DEAL & like the art, why not acquire more than 1 piece in the series? 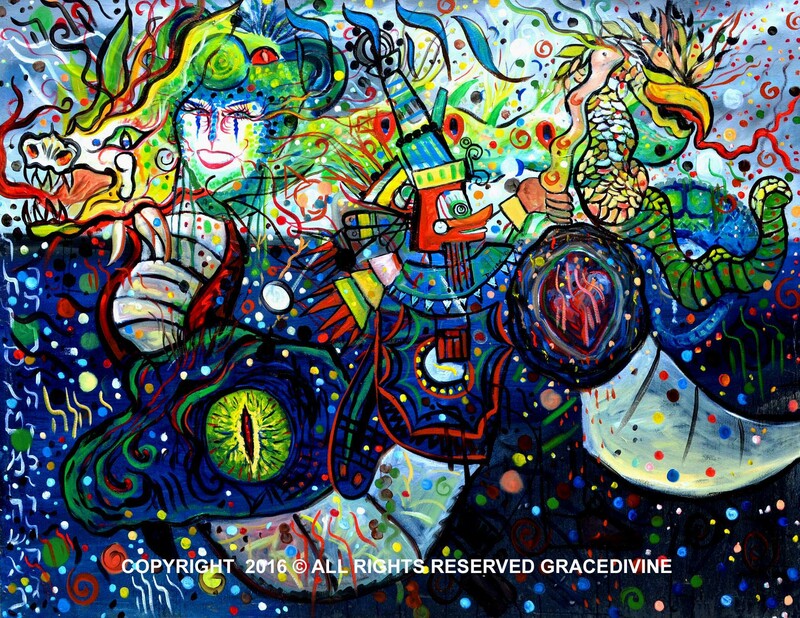 any art acquired via GraceDivine.com is dedicated to RAISE AWARENESS TO A HUMANITARIAN CAUSE. and are sensitive towards finding solutions to issues that matter to everyone today. directly from the ARTIST STUDIO, GUARANTEES THE BEST PROVENANCE AVAILABLE ANYWHERE and ANY TIME! 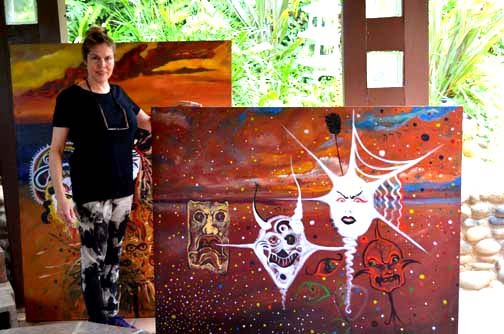 directly from the ARTIST STUDIO is the BEST GUARANTEE OF BEST PROVENANCE YOU CAN GET ANYWHERE! result in LIFE AFFIRMING CELEBRATIONS! Any donated amount will be appreciated and we thank you so much. Sending love and peace to all. Your friend and your artist, Grace Divine. We enjoy putting together events that include education, information, music, art, dance and more. you are happy. Please order your art now. And thank you. THE FOLLOWING IMAGES SHOW THE SIZE OF THE ART. so some of the paintings are unfinished. 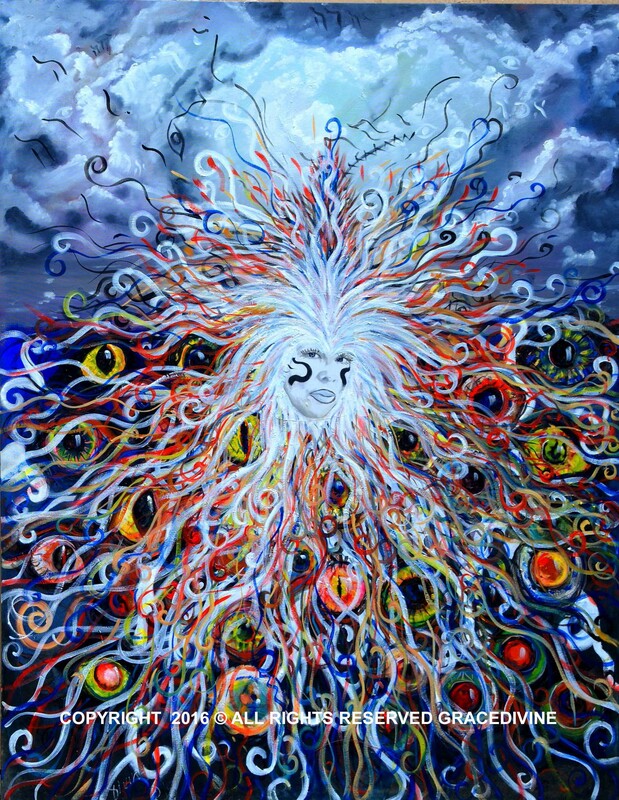 "Healing the soul with the Shaman's Power! 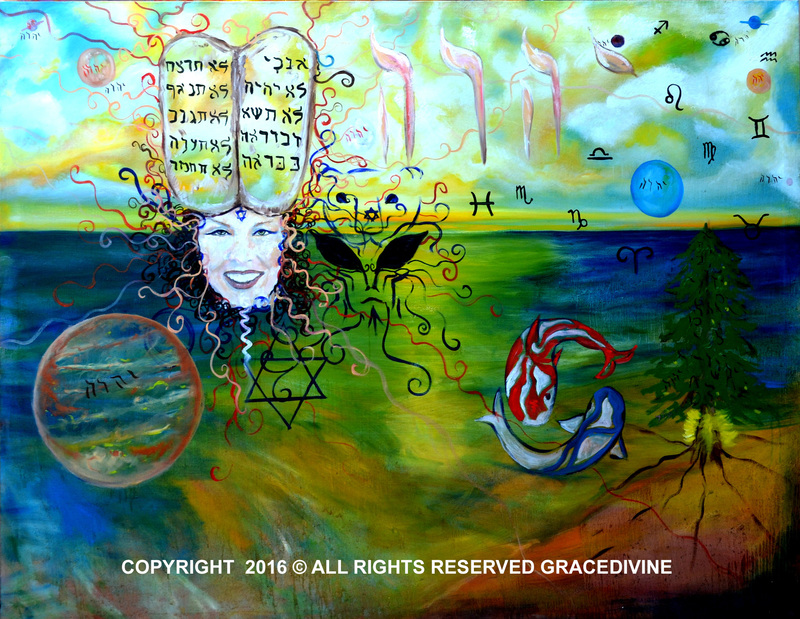 Soul Retrieval with Courage to Face our Fears"
Using the holy 72 names of God in Hebrew an expression under the umbrage of the holy blessed US Constitution, freedom of speech and RELIGION, each painting constitutes A PRAYER! This art was created as a reaction to the depression of a friend which ended in suicide. As such, the art challenged my mind to heal by helping it face what is inside it, no matter how horrific. 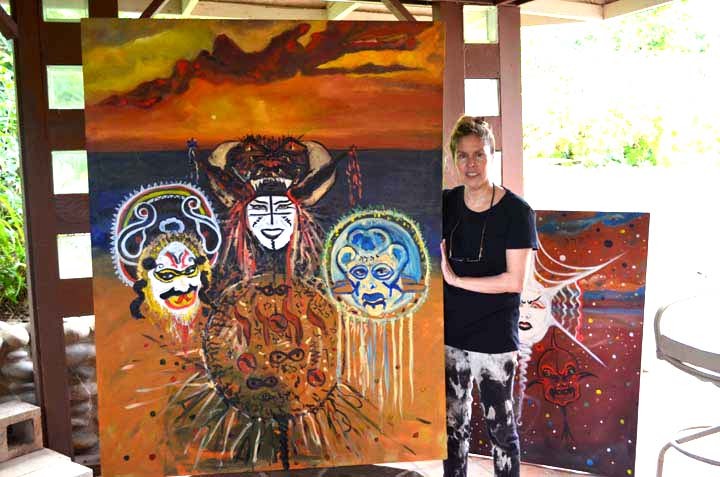 All of the foregrounds for these paintings were finished over a span of 2 1/2 months, April, May, June 2015. They were inspired by a friend who left us as a result of depression. So these paintings are dedicated to him. 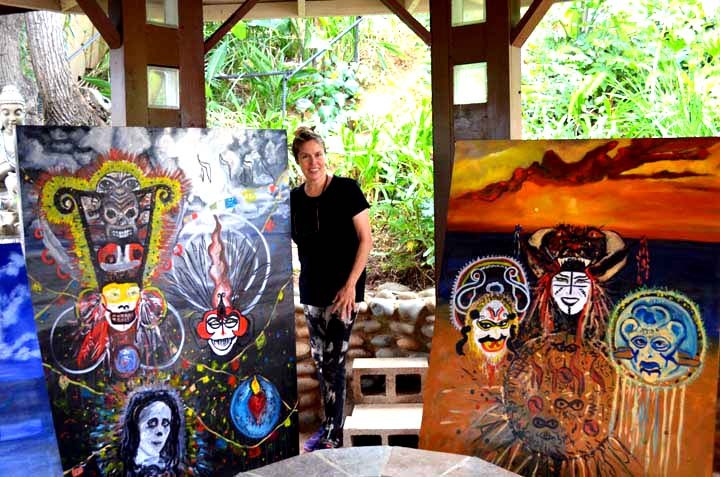 As long as these paintings are somewhere on earth, you, dear friend, will always be remembered and loved. This is art that expresses my personal experience and no one elses. It is about having COURAGE to go within into the inner landscape and FIGHT, LIKE A WARRIOR, for the soul, taking it back. And what I mean about the inner landscape is the MIND. 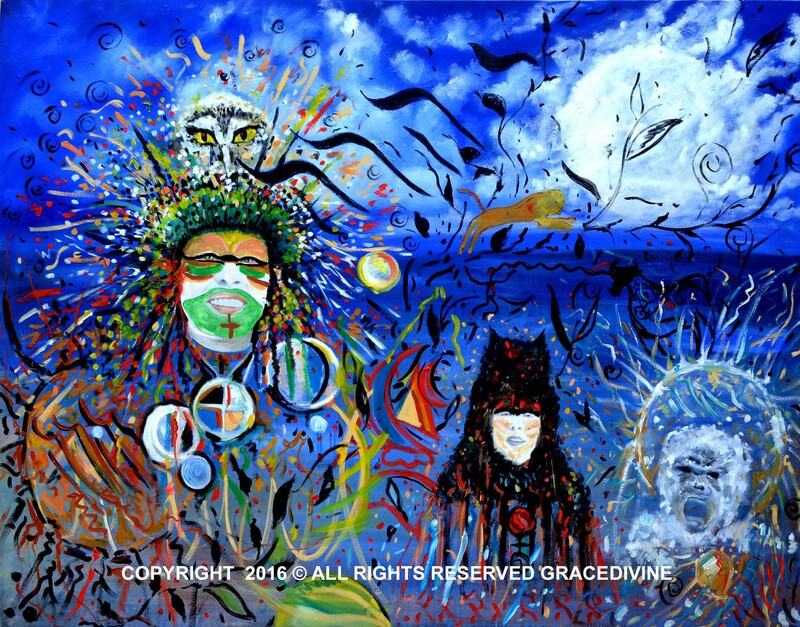 For thousands of years when human beings lived in TRIBAL SYSTEMS, there was a Shaman. 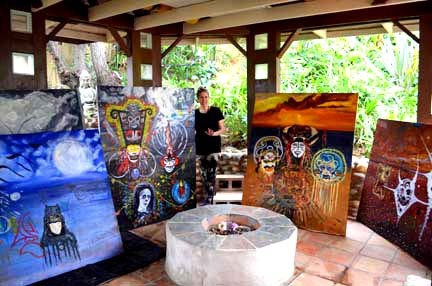 Typically, this person was connected to nature and through their work, they connected the tribe to nature. In addition, the shaman provided HEALING. The belief in animistic societies was that the world was filled with life and energy. 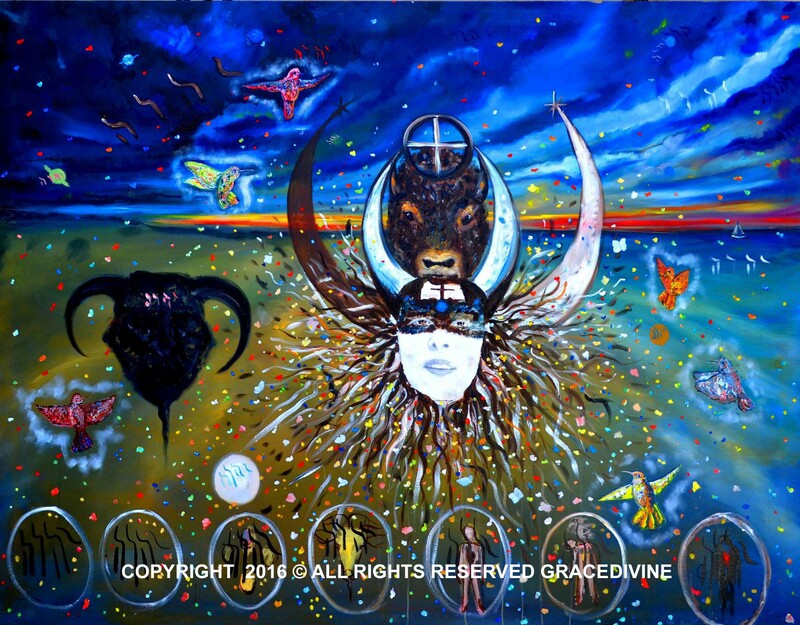 The shaman was the healer, teacher, counselor, and also connected the tribe to the ancestors asking for help and assistance and for the survival of the tribe. 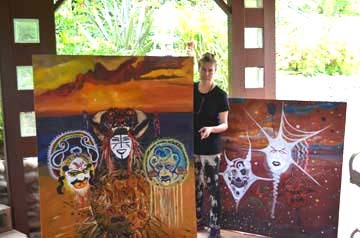 In the paintings here, I have included OUTFITS or MASKS from different shamanic cultures. 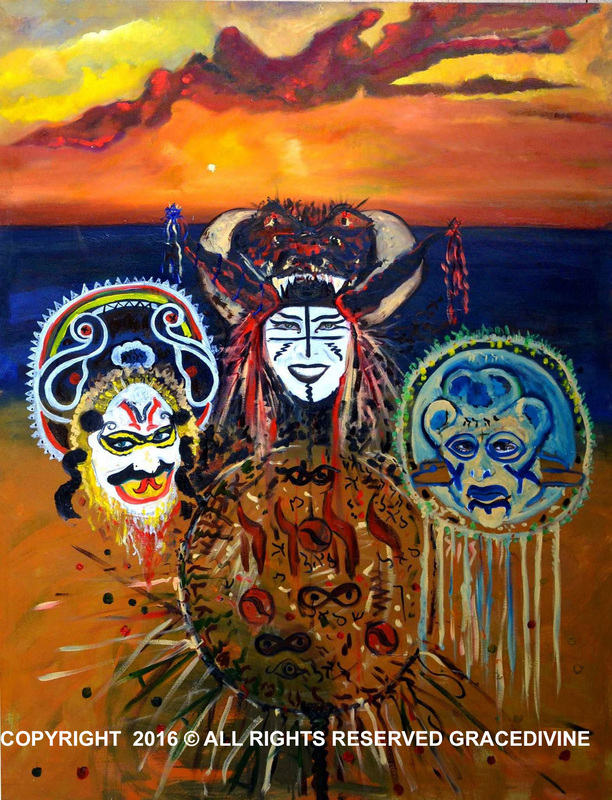 From the beginning of time, the shaman would dawn the MASK in order to connect to nature, become the animal totems, find answers to help the tribe, find healing for others, communicate with those departed... From the beginning of time, we find in caves, drawings made by shamans as they prayed and comunicated with the ancestors and nature in order to do different things, like for instance, improve the hunt. etc. Often, the warrior masks and costumes were worn as a form of respect. Hence, masks and costumes, similar to those found in the art here, can be found everywhere where there are ancient cultures! These are original one of a kind oil paintings that I painted on canvas. This means that the only materials used in the art were OIL PAINTS, pencil and paper. That is all. NO OTHER MATERIALS WERE USED IN THE MAKING OF THIS ART! 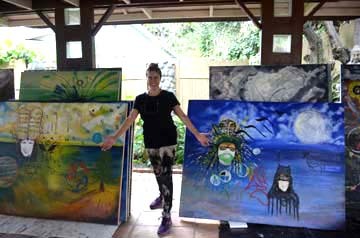 The art is stretched on stretchers made in my studio. The paintings are huge as each painting measures 4+ feet by 5+ feet. 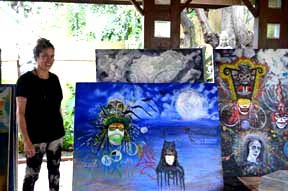 Finally, the STYLE OF THE ART is: symbolic, surrealistic, primitive, shamanic, metaphysical, psychological, spiritual, animistic, and modern. Also, they are anthropological and sociological as they are influenced by tribal ideas from around the world. If you would like to listen to music with this art series listen to Wiz Khalifa See you again.